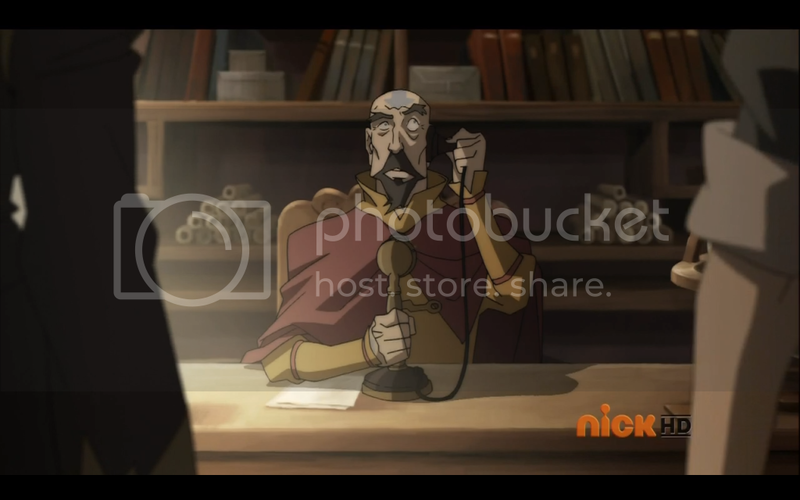 Tarrlok hides Korra in a box that looks somewhat like the platinum Hiroshi Sato used on his robots. 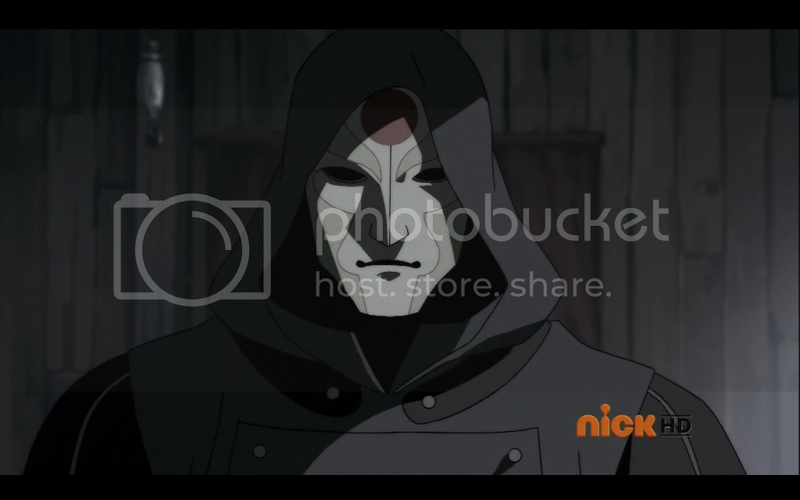 He returns to City Hall and claims that Equalists attacked and kidnapped Korra. Lin hears about the kidnapping on the radio, and goes to break out Korra’s friends. 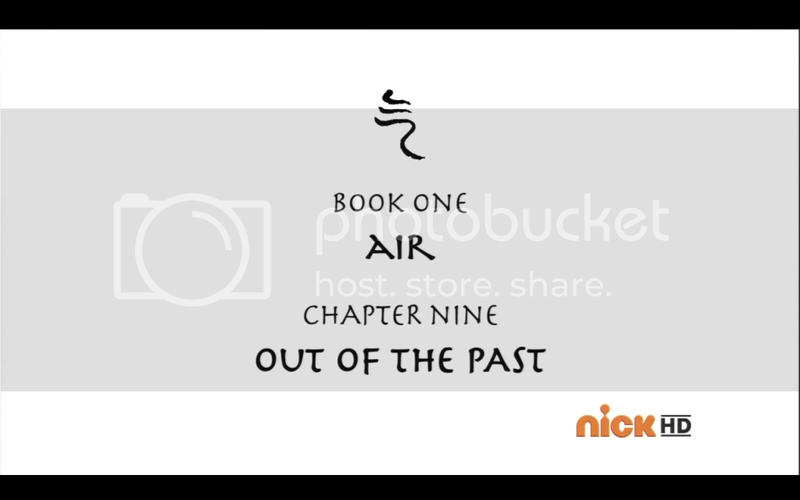 Korra, unable to break out of the box, meditates, trying to make a connection with Aang. 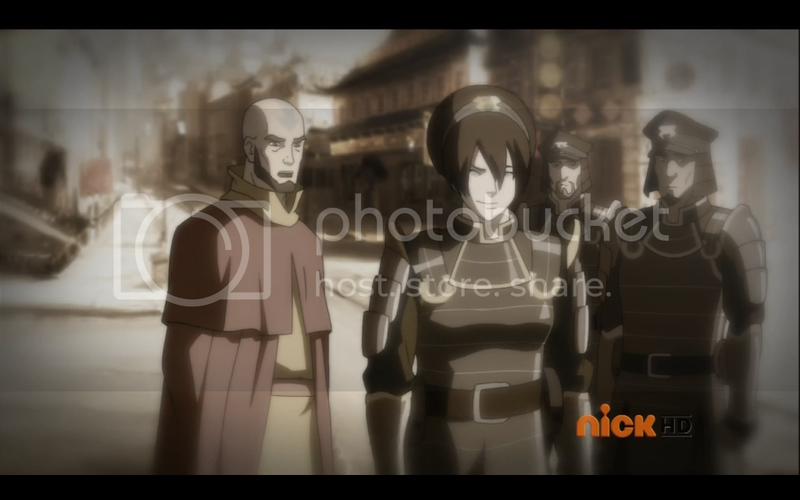 She sees a flashback, of a forty year old Aang and Toph arresting the criminal Yakone. Korra wonders what Aang is trying to tell her. 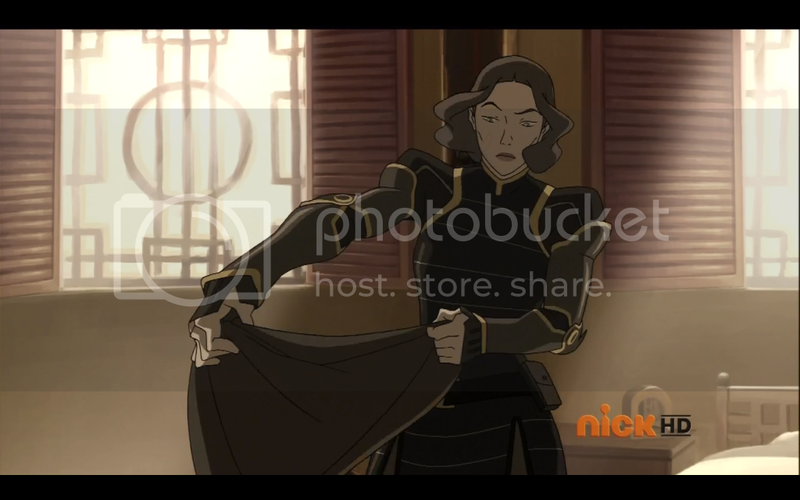 Lin and the other three go to Tenzin’s office, and the four of them start looking for Korra. 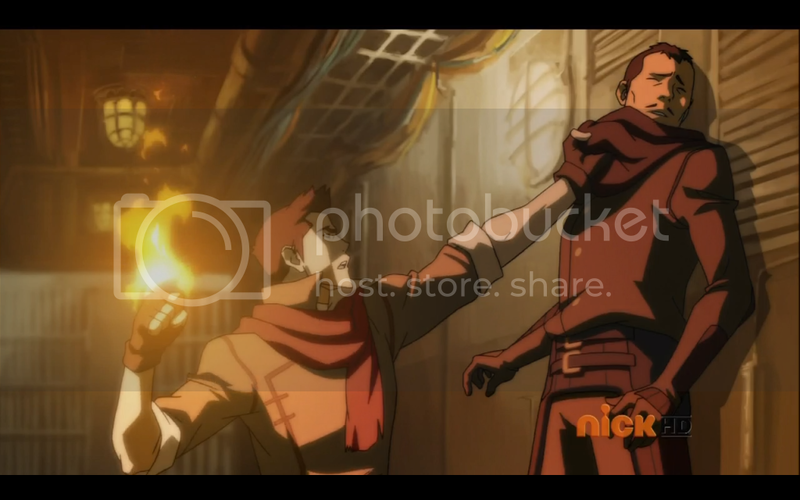 They go to where Bolin was kidnapped and find a tunnel. 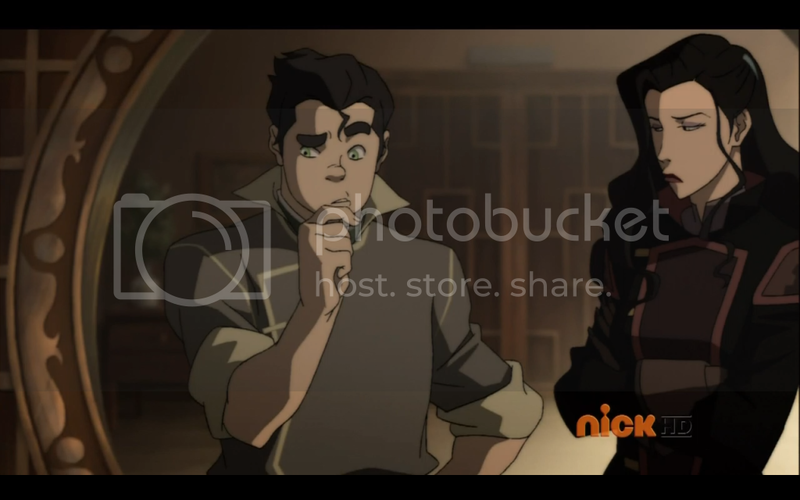 While they walk through the tunnel, Asami asks Bolin about Mako’s strange behavior. 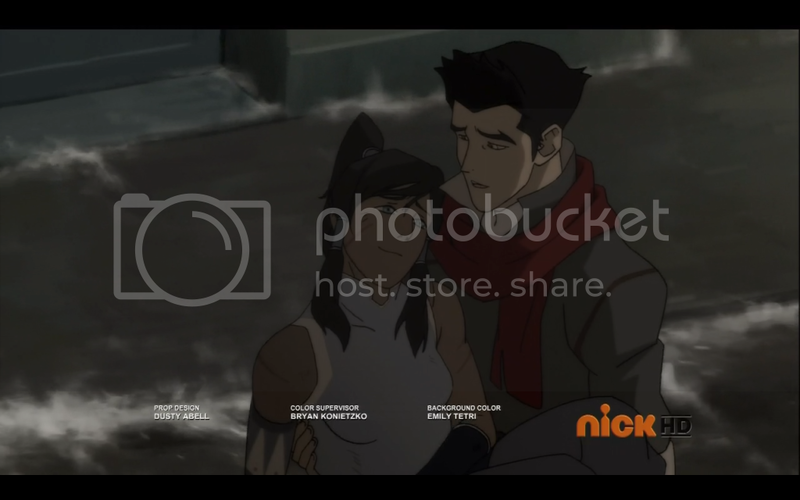 Bolin lets slip that Korra and Mako kissed during the tournament. They find two Chi Blockers, who reveal a secret door. The group make their way down into the prison, breaking out Lin’s officers, and discovering that the Equalists did not kidnap Korra. They make their way out, escaping from Lieutenant and several of Hiroshi’s robots. Korra continues to meditate, and sees Yakone’s trial. The prosecution declares that Yakone is a bloodbender, while the defense claims that all of Yakone’s alleged crimes occurred any time but the full moon. Sokka cites Combustion Man as a precedence for benders that break the normal rules of bending, and they find Yakone guilty. 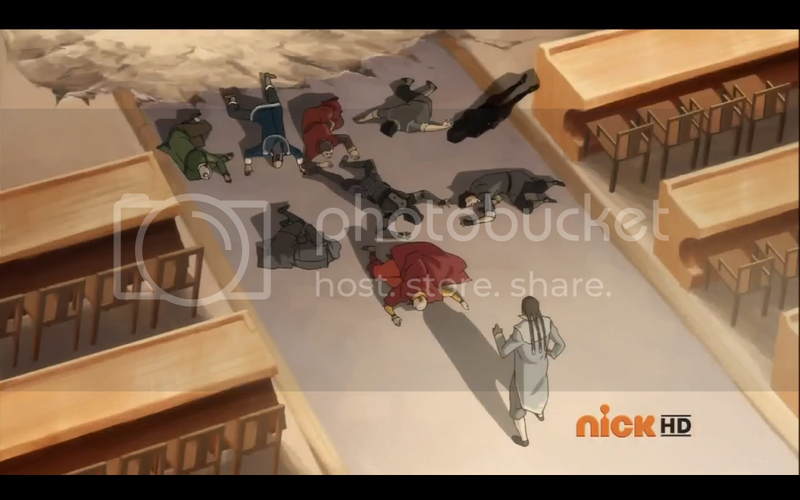 Yakone uses his bloodbending to take over everyone in the courtroom. Tenzin and the rest meet the council, along with Tarrlok. 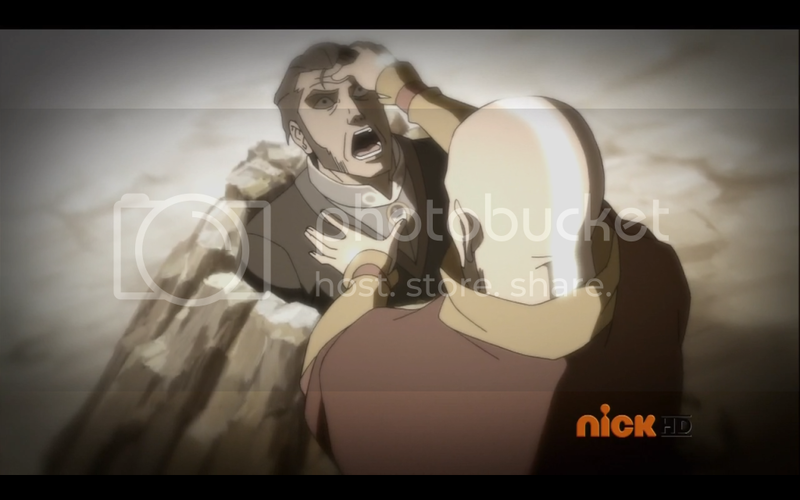 Tenzin accuses Tarrlok of kidnapping Korra. He denies it, but his assistant reveals that he saw Tarrlok take Korra. 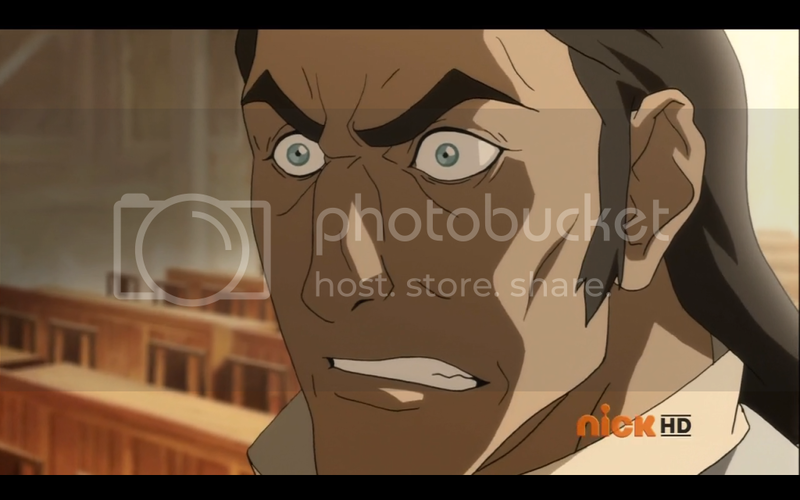 When asked why he didn’t come forward sooner, the assistant reveals that he was afraid because Tarrlok is a bloodbender. Cornered, Tarrlok uses his powers to knock everyone out and makes his escape. In the flashback Yakone escapes, controlling Toph to make her open his handcuffs. Once his arms are free he knocks everyone out and escapes. Aang wakes up, using the avatar state, and chases after Yakone. He overpowers the bloodbender and takes his bending away permanently. 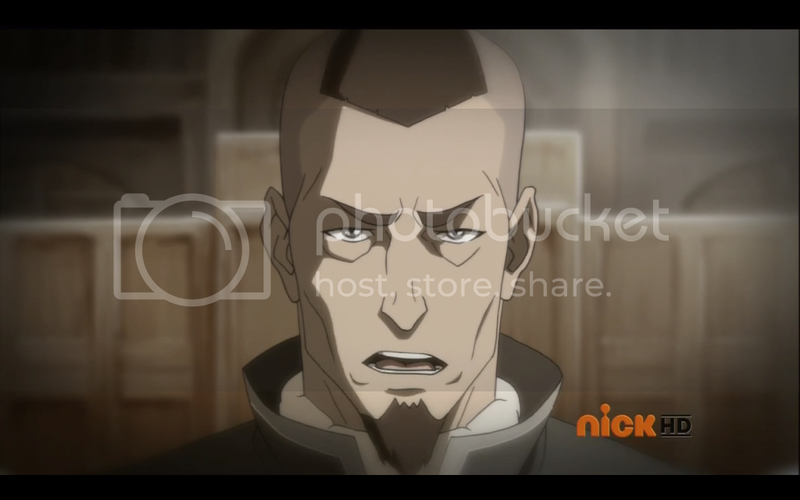 Korra reveals to Tarrlok that she knows he’s Yakone’s son. 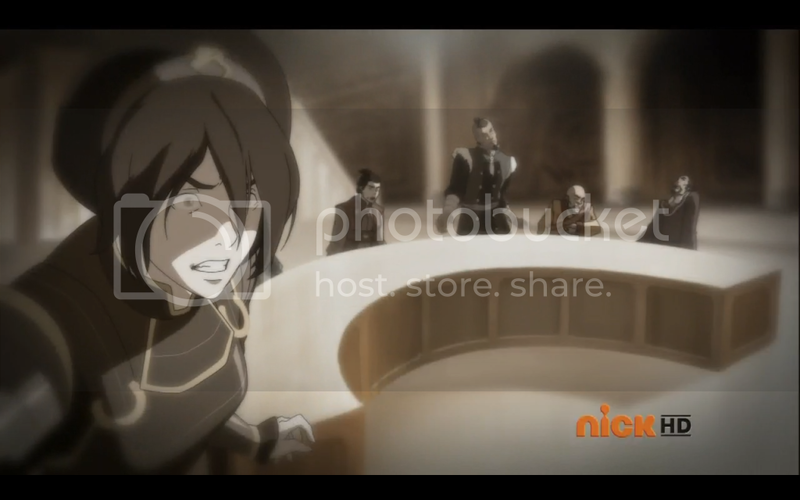 Tarrlok tells her he’ll make his escape, and take her along as a hostage. As he is about to leave, he finds Amon standing at the top of the stairs. Tarrlok takes out Amon’s Chi Blockers, but Amon is able to resist Tarrlok’s bloodbending. 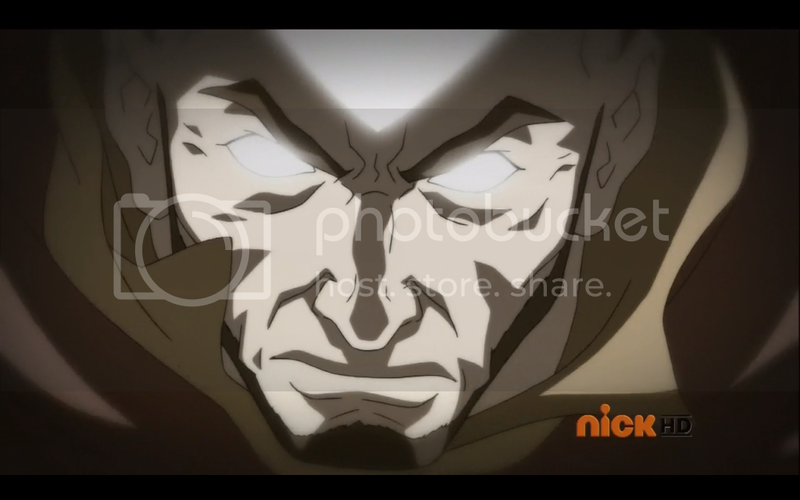 He defeats Tarrlok and steals his bending. Lieutenant and the other Chi Blockers go down to take care of Korra. They electrocute the box to knock her out, but she hangs from her wrist wrappings and escapes harm. She fights her way free and escapes. When she sees Amon she escapes down the mountain. She trips on a root and knocks herself out. 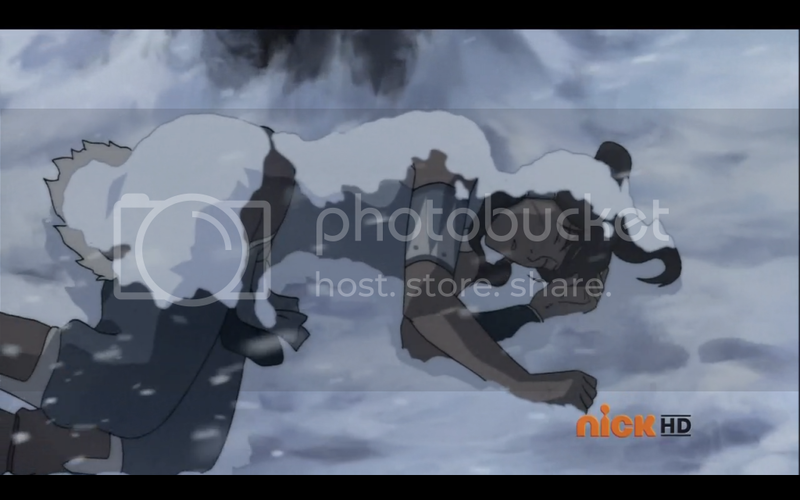 Naga finds her and carries her back to Republic City, where Tenzin and the others find her. Mako carries her to Tenzin’s bison. This would be legitimately touching, if it weren’t so poorly executed. Finally we get to see the whole flashback. Seeing the grown gaang was a lot of fun, even if their adult voices took a little bit of getting used to. But now that we finally get some proper flashbacks I feel like I drank a large cup of soda. Rather than quench my thirst it’s just made me ravenous for more. 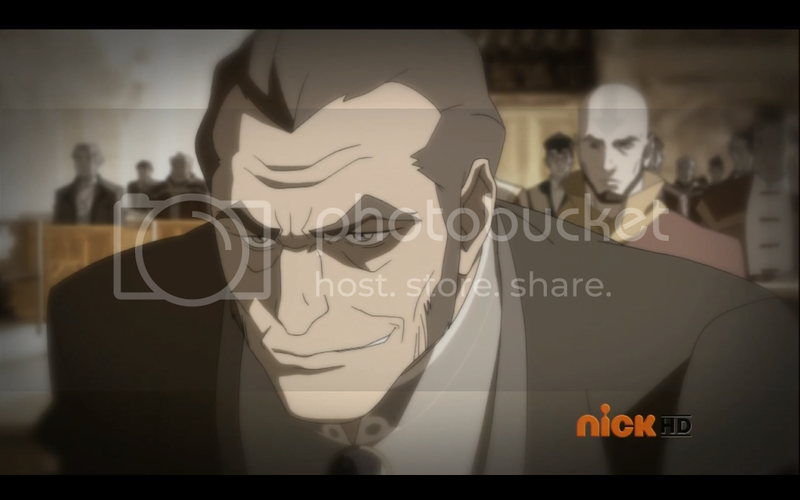 With Tarrlok’s end we finally get to see him for what he was, a red herring. Or at least that’s what it seems like. A lot of the speculation the fragments of flashbacks engendered, we all assumed that they had something to do with Amon. But as Korra herself said, Aang was trying to warn her about Tarrlok instead. The problem with this is that we spent so much time on the red herring that the main conflict is going to have to be stuffed into the last three episodes. I can’t help but feel that this kind of story needed a full season, not a half season. Mako’s behavior throughout the episode was frustrating. I started off not caring about him, then a few episodes in I thought he was a decent enough character. But ever since the past few episodes it’s been very, very hard to sympathize with him. His inability to pay attention to Asami’s feelings throughout the episode rubbed me the wrong way. The problem is that I don’t think this is an issue of his personality. Rather it seems to be an issue of writing. I’m not sure if Mike and Brian are aware of how erratic they are writing Mako. Say what anyone want about him, he’s a poor substitute for Zuko. So far at least. There’s always room for growth, but if his problems are caused by sloppy writing I don’t have high hopes for him. I blame the prevalence of shipping in the fandom. The Kataang and Zutara ship wars warped how Mike and Brian approach storytelling. They started off writing a story where romance was not a major part. It was there, but it didn’t take off until the fandom really sunk their fangs into it. The problem is that now they believe this is what the fandom wants, and they aren’t entirely wrong. But by trying to cater to the desires of the fandom they are sacrificing the natural development that appealed to fans in The Last Airbender. What we end up with is a series that has excessive and poorly implemented romance. Again, part of that can be blamed on the shorter run time for this first season, but that shouldn’t be an excuse for a sloppily written romance. To make an engaging romance the viewers need to love the characters involved. 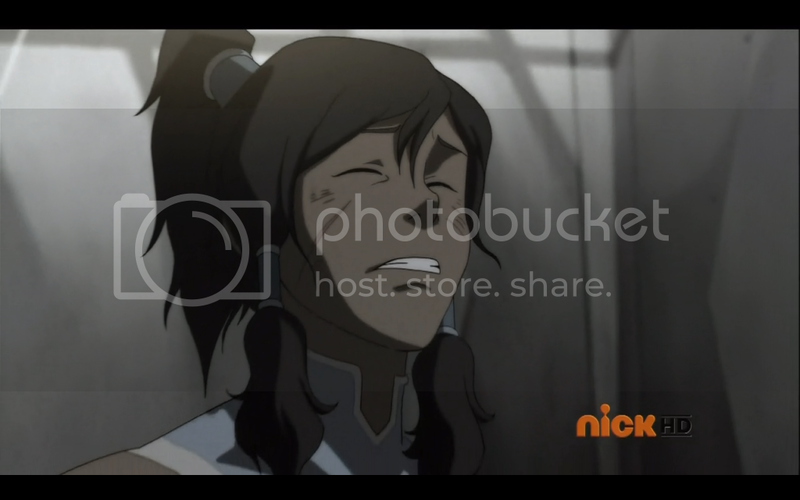 I love Korra, I’m not so hot on Mako. Because the romance is so forced there wasn’t enough time for me to get attached to the characters. Honestly, if they were going to have Korra and Mako end up together they should not have introduced Asami as a romantic interest for Mako. The less time a story has, the fewer complicating elements it needs. And a love triangle is about as complicated as any story can get. Buy Avatar Stuff Here: Avatar DVDs and Instant Streaming!